Vacuum and pressure thermoforming for the purpose of this discussion is to be considered a single sheet of “heavy gauge” (>.060” thickness) thermoplastic, which is held in a rectangular or square platen, heated in a oven to an optimum forming temperature, then formed over a single sided tool. As thermoforming is a done with a single sided tool, the critical surface of the part should always face the tool as this is the “controlled” surface with the best tolerances and surface treatment. Features formed on the controlled side of the part will telegraph through to the back side and vise versa. Below are general thermoforming design guidelines. The single sided tool can be positive or negative in design. The common tooling materials are: medium density fibreboard (MDF), urethane, epoxy, and aluminum. The material is either fabricated, CNC cut, and/or cast to form the tool. Small vacuum holes are drilled in the tool. A sealed vacuum box and vacuum system are used to form the heated plastic to the tool. Pressure may be applied to the side opposite the tool, possibly along with a plug assist to enhance certain features for cosmetic, close tolerance parts. Draft is the degree of taper of a vertical sidewall to facilitate removal of the part from the tool. On side walls greater than 2 inches (5cm), draft is most likely needed. Recommended degrees of draft vary with the geometry, plastics material, and tool material. Always provide the maximum draft possible for any given vertical feature, as this can help minimize de-molding problems and may help reduce part cost. 1.5-2º of draft is a minimum on a negative feature, and a deep texture will require more. For positive features, minimums are in the 3-5º range. The deeper the feature or rougher the surface texture, the more draft is required. Radius is defined as the detail provided at the intersection of two planes or surfaces. These surfaces can be horizontal, vertical, or both. The greater the radii the better from the perspective of material distribution and part rejection (and therefore cost). Tight radii in the range of .015” can be attained in a negative pressure-formed part. Over a positive feature, the thickness of the material plus .030-.060” or more is desirable. The draw ratio expresses the relationship between the beginning surface area of the unformed sheet which covers the opening of a feature, and the ending surface area of the interior of the feature once formed. A 3 to 1 ratio is generally a maximum draw ratio. Avoid multiple tall features too close to each other. Generally, the distance between two features, like ribs or cooling vents, needs to be no less than 2x the material thickness. A caution about corners: Avoid intersections of walls that are >90º, as it can be very difficult to get material to flow into that feature. Undercuts are features protruding from or into the tool surface, which would prevent removal of the part from the tool. Such features are possible with the use of movable “core-pulls” in the tool (note: this increases both tooling and production costs). These cores are used to form the feature, then, are retracted to allow the part to be removed. Under cuts are generally not to exceed 5/8” in depth. Reference points should be designed into a part, which allows a measurement from a controlled (molded) surface or point to a critical feature of the part, such as drilled hole centers, cutouts, or other features. Ribs may be formed into the part according to the parameters above. Ribs are used to support a flat surface. Ribs or other reinforcement may also be machined independently and glued in at added cost. Internal bosses may also be independently machined and glued in. Texture may be incorporated into a given part either by using a textured raw material or by texturing the face of the tool. Texturing is of course an added expense and requires increased draft. More than one texture can be done on a part, as can areas of no texture. Two parts may be joined together such as a front and back case. The preferred joint is a lap joint, which would be formed as a rib or under-cut on the edge of one part. The joint should also require a witness line of about .060” to accommodate tolerance variation of the joint. Trimming dimensions need to be referenced from the molded side of the part. Vents, or openings may be molded in by the use of a positive feature, and then machined off from the back to give a finished outside edge where hardware or electronics are mounted from the inside to show through to the exterior. All manner of hardware can be attached in secondary operations. And oftentimes hardware can be “insert-molded” into the part. Tolerances are a variable, which ranges from the thickness and surface of the extruded stock, through tooling, trim and precision routing. Always provide the greatest tolerance possible to reduce costs and lead-time. • Drilled hole Diameters are +/-.005” up to .375” dia., plus .001” (0.1%) per 1/16 above .375” dia. Almost any thermoplastic can be thermoformed. There are a great many resins and combinations of resins (alloys or capped sheet) available to meet almost any application’s requirements, and more are being developed every year. 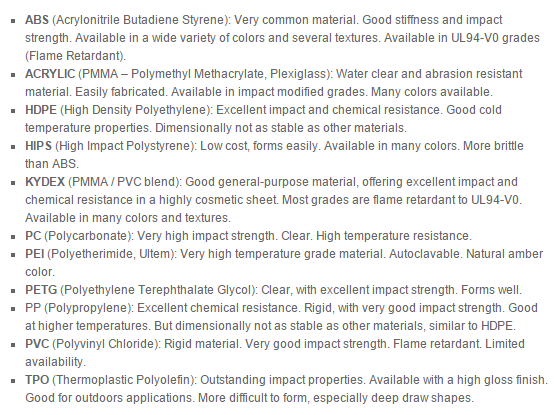 The table below lists the major categories of resins that Lormac Plastics uses on a regular basis. “Key properties” is a brief description of the more salient characteristics, but each resin type is quite diverse in the range of properties and properties that can be “tuned” to a purpose. The “Notes” section below indicate some of the range of modified properties available for the different resin families.